It was in 1791, some two years after the infamous Mutiny on the Bounty, that watchmaker and goldsmith Jean-François Bautte signed his first watches. Orphaned at a young age, Bautte was apprenticed at the age of twelve and trained variously as a case fitter, guillocheur, watchmaker, jeweler and goldsmith. 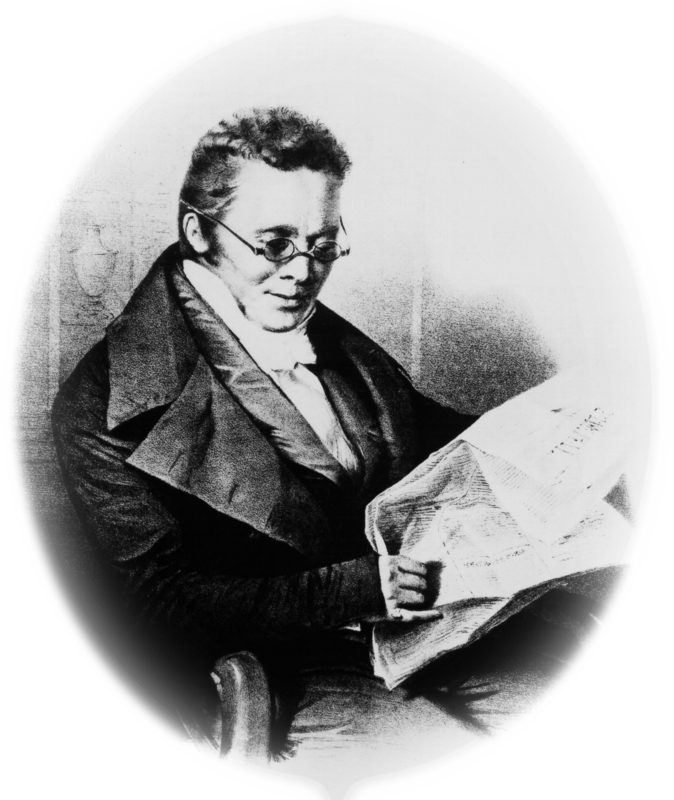 He signed his first watches in 1791 and, with his talents as a craftsman reinforced by a strong head for business, he soon developed his own manufacture. Portrait of Jean-François Bautte (1772-1837). Bautte created a manufacturing company in Geneva, where, for the first time, all the watchmaking constituents of the time were developed under one roof. This enabled the engineering of the watch all the way through to the final hand-assembling and polishing of each timepiece. Being a dandy – a fashionable gentleman of his day – Bautte specialised in the creation of slender pocket watches that would fit neatly into breeches tailored so tightly that the wearer could not sit down in them. This was a leisurely age when a man could spend an hour worrying about the flounces of his shirt cuffs. Bautte was particularly skilled in the art of miniaturisation. His aim was the creation of wafer-thin watches with Lilliputian mechanisms. He excelled in irresistible watch jewelry known as ‘watches of shape’. These were watches disguised as miniature musical instruments, butterflies or flowers, and even a watch in the form of a perfume-dispensing gun, an enameled pistol that fired not bullets but perfume. There is simply no guessing what he might have created today, with all the advantages of modern technology. In a city famed for being home to a thousand watchmakers, it was this technical approach that made Bautte unique. He was quick to understand the importance of new technology, and to translate it into highly desirable and aesthetic pieces. In addition to this, he had a talent for administration. 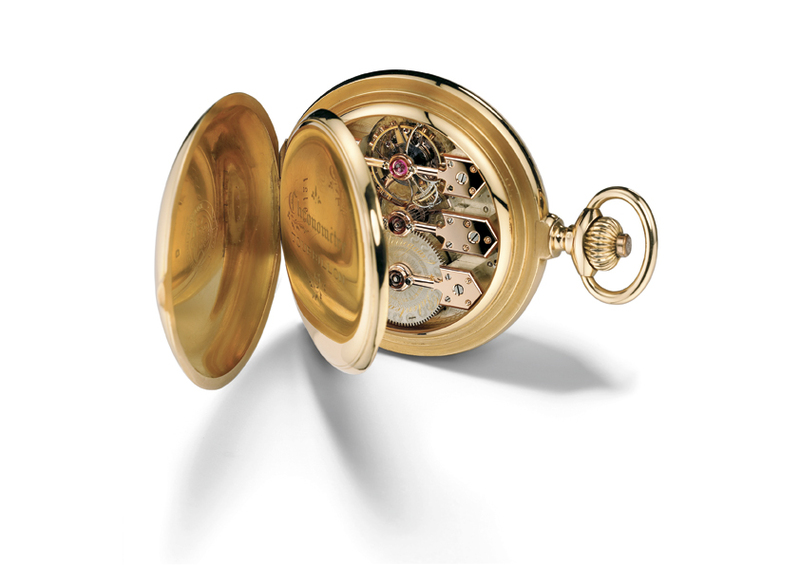 As a result, Bautte developed in Geneva the most complete watch manufacture of his time. The name of Bautte appeared in the writings of Alexandre Dumas père, in Balzac’s Letters to the Stranger and in those of John Ruskin. Some of Bautte’s prestigious clients included Queen Victoria and the French writer and socialist the Duchess of Clermont-Tonnerre. 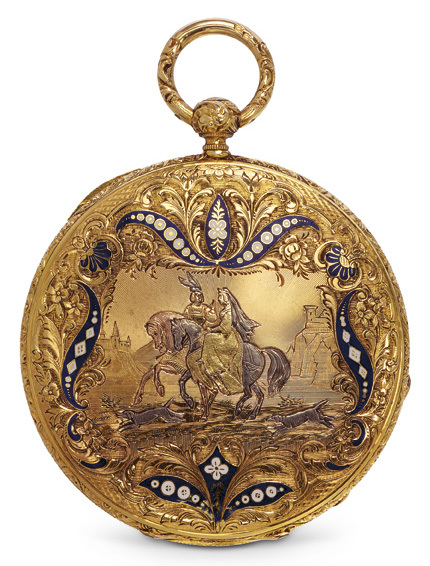 On his death in 1837, Jean-François’ son Jacques Bautte and his son-in-law Jean-Samuel Rossel, inherited an extremely efficient and well-run company with a rich cultural heritage, and they went on to win several awards for their chronometry. 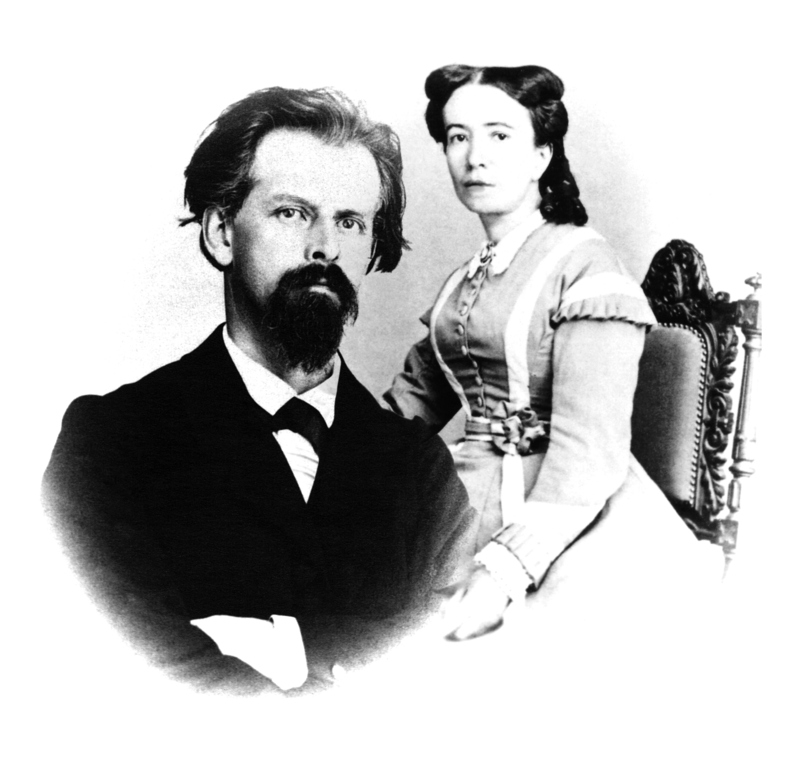 In 1856, the watchmaker Constant Girard (1825 – 1903) founded the Girard & Cie firm and two years later went on to marry Marie Perregaux (1831 -1912), the daughter of a noted watchmaking family from Le Locle, and in the process they acquired the Bautte–Rossel manufacture. To this day, their two surnames still form the name of the manufacture in La Chaux de Fonds. Portrait of C. Girard (1825-1903) and M. Perregaux (1831-1912). 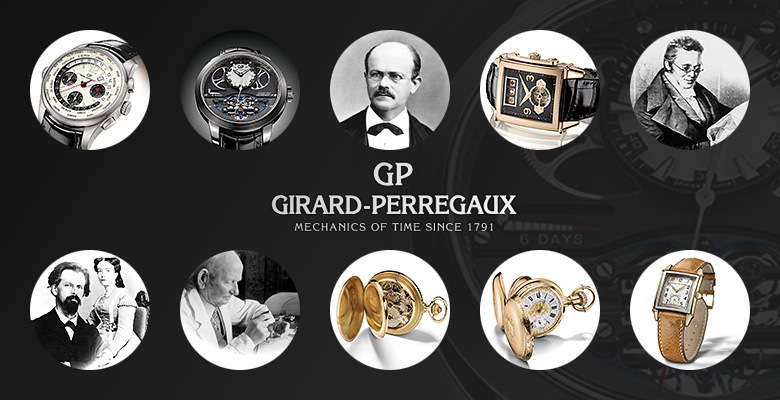 Girard-Perregaux quickly became established as one of the finest names in the Swiss watch industry. In 1889, Constant Girard presented his masterpiece, still faithfully recreated in various versions to this day: the Tourbillon With Three Gold Bridges. Constant Girard-Perregaux devoted long years to designing and crafting various escapement systems, particularly the Tourbillon escapement. The quality and beauty of his creations were rewarded by a number of prizes and distinctions at national and international exhibitions and competitions, and also at Universal Exhibitions. In 1906, 40 year old Constant Girard-Gallet (1856 – 1945), who took over control of the manufacture from his father, Constant Girard, acquired the Bautte House and merged it with Girard-Perregaux & Cie. Girard-Perregaux has aince managed to reinforce its position as a dominant brand in prestigious mechanical watchmaking. And under the leadership of the Sowind Group, headed by the Macaluso family, the brand has gone from strength to strength. 1880 Constant Girard-Gallet, who inherited the company from his father, produces the first ever commercial wristwatch, commissioned by the famous Kaiser Wilhelm for his naval officers. Two thousand watches were delivered, representing the first significant commercialisation of wristwatches. 1965 Girard-Perregaux design the first mechanical movement at high frequency, at which the balancer beats at 36,000 vibrations per hour: the Gyromatic HF. 1967 Girard-Perregaux receives the Centenary Award from the Astronomical Observatory of Neuchâtel in recognition of the accomplishments of the manufacture in general, and specifically for the Observatory Chronometer wristwatch that used the Gyromatic HF movement. 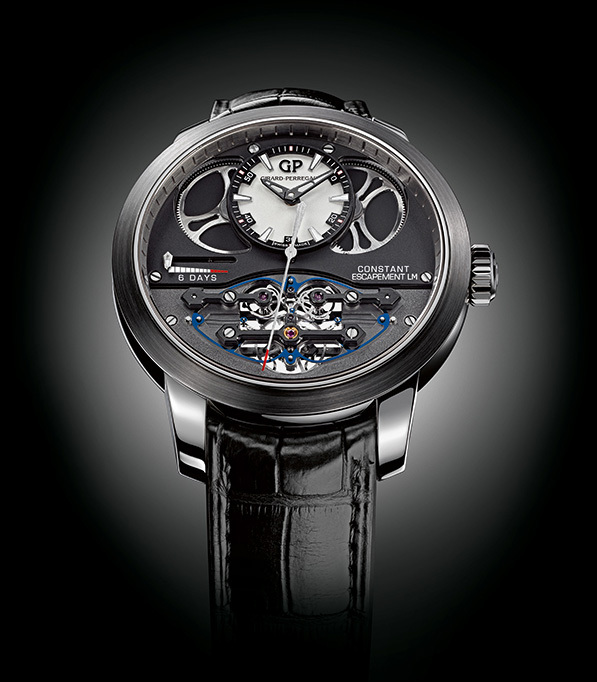 2008 The brand presents a constant-force escapement at the Salon International de la Haute Horlogerie (annual salon of high-end watchmaking), distinguishing itself among other known escapements to this day. 2013 The Brand win the Aiguille d’Or at the Prestigious GPHG 2013 ( GPGH 2013 Results on DreamChrono ). 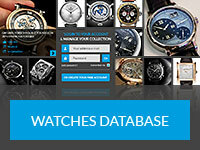 More resources about Girard-Perregaux available on Wikipedia, and Official Girard-Perregaux Website.